Fireman First Class Robert Penn (10 October 1872 - 8 June 1912) was a U.S. Navy sailor who received the U.S. military's highest award for valor, the Medal of Honor, for his heroic actions during the Spanish-American War. 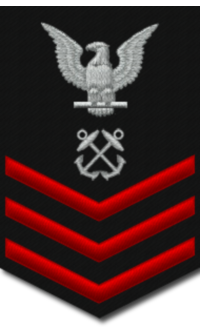 Robert Penn was born on 10 October 1872 in City Point, VA. On 20 July 1898, Penn was serving as a Fireman First Class on the USS Iowa (BB-4) off the coast of Santiago de Cuba when a boiler accident occurred. 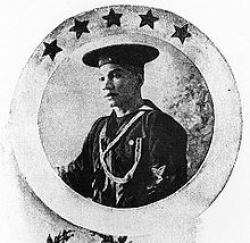 For his actions during the incident, Penn was awarded the Medal of Honor. Citation: On board the USS Iowa off Santiago de Cuba, 20 July 1898. Performing his duty at the risk of serious scalding at the time of the blowing out of the manhole gasket on board the vessel, Penn hauled the fire while standing on a board thrown across a coal bucket 1 foot above the boiling water which was still blowing from the boiler. Fireman First Class Robert Penn died on 8 June 1912 in Las Animas, CO. He is buried at Eden Cemetery in Collingdale, Delaware County, PA, in Tubman Section, Lot 155.